The submission of film entries for the Itanagar International Film Festival 2019 has been extended to February 5, 2019. The film festival will be organised from February 22 to February 24, 2019. 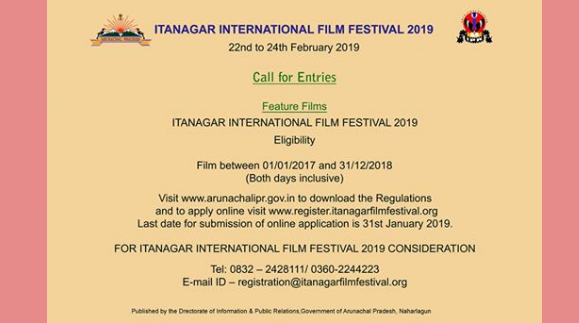 “The last date for submission of film entries for the Itanagar International Film Festival (IIFF) 2019 has been extended to February 5 from the earlier date of January 31,” said sources. Films from the eight states of the Northeast that have been produced between January 1, 2017 to December 31, 2018 are eligible to apply for the Competition Section of the IIFF. The three-day film festival will be organised by the Directorate of Information and Public Relations (DIPR), government of Arunachal Pradesh. The submission of film entries for the Competition Section was opened on January 20 and January 31, 2019 was fixed as the last date for the same. But the organisers have decided to extend the last date to February 5, 2019 so that more filmmakers can join the festival with their films. The best film and best director will win cash prizes of Rs 4 lakh and Rs 2 lakh respectively while the best male and female actors will bag a cash prize of Rs 1.5 lakh each. The special jury award winner will take away a cash prize of Rs 1 lakh. The festival will be managed by the Entertainment Society of Goa (ESG), the nodal agency which successfully conducts International Film Festival of India (IFFI) in Goa every year. The film festival, to be organised at Dorjee Khandu Convention State Centre and IG Park in Itanagar, aims at promoting northeastern films, tribal films and critically acclaimed films from different corners of the globe. A total of 35 to 40 films will be screened at the film festival. The films will be screened in various categories – Indian Panorama, World Cinema, and Far East Asian Films, Children’s Films, documentary films, Competition Section Films and outdoor screenings of critically acclaimed films of Indian Cinema, said sources.